All CAMINO BANDERA homes currently listed for sale in San Antonio as of 04/24/2019 are shown below. You can change the search criteria at any time by pressing the 'Change Search' button below. "Super location and wonderful neighborhood. New interior paint and new carpet. Two story entry way, dual masters, water softener, library/study upstairs along w/large media room. Crown molding! Treed 10000sf lot with privacy fence and sprinkler system. Fireplace, dual a/c units, island kitchen, Corian tops, convection microwave oven, large breakfast nook and formal dining room. Detached garage. Close to UTSA, USAA, Loop 1604, Northwest Vista College, parks, library and Gov't Canyon. Norths"
"***Come see this beautiful 4 side brick home with energy saving solar panels, detached oversized 2-car garage, 2 cozy patio slabs accented by mature trees for you family gatherings. Inside you will find an open floor plan with custom flooring, vaulted ceilings, nice wine closet, formal dining and living rooms, spacious bath rooms, full utility room with access to patio, and lots of closet space. It's a short commute to USAA, Helotes, Sea World, Fiesta Texas and La Cantera Mall. 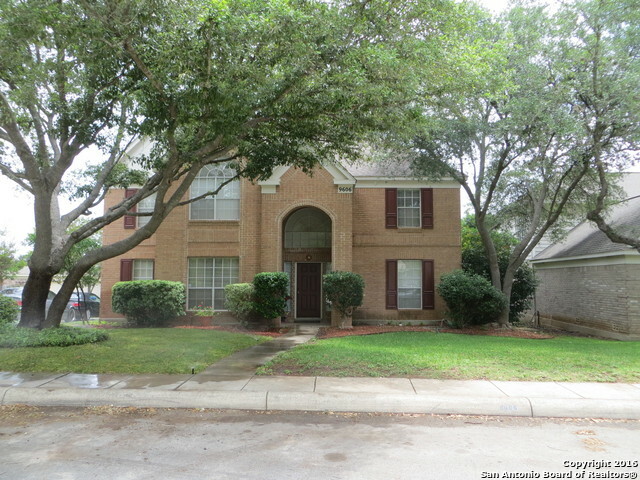 Come see for yo"
"Lovely 4bd/3.5ba in popular Camino Bandera, detached garage, mature oak trees, lovely formal dining room, huge master and master bath downstairs, Jack-n-Jill bathroom upstairs, media room and game room, conveniently located near shopping, Northside ISD, easy access to 1604. Great location!"